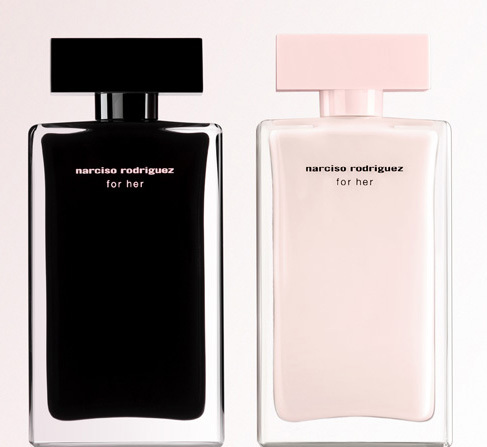 Narciso Rodriguez’s signature fragrance collection, called Narciso Rodriguez for Her, resonates with memories of the Egyptian musk he was once offered by an unforgettable woman. The initial fragrance – Her Eau de Toilette – was composed of a rare musk and a blend of floral, amber and woody pulsations, creating an elegant, subtle and translucent “sheer chypre” fragrance whose skin-on-skin sensuality that resonates mysteriously and transforms magically. In Her Eau de Parfum, musk remains the heart and provides an acute sensuality, backed with an olfactory lacework of pink chypre, which become the true soul of the composition: A rare weave of pink floral with hints of rose and peach pulp, and soft amber and wood in pastel tones. Bathed in the voluptuous musky richness, the composition has a decadent feel of a raw silk dress caressing your skin. And the bottle matches up to the fragrant intricacies: An exclusive and revolutionary technology has been used to lend a mysterious aura to the scent and approach the perfection of the ancient Chinese snuff bottles. Painted pale pink from within, the bottle is a reflection of modern femininity, with a light infused glow and a lustrous patina. The result: A work of unfettered elegance and modern grace, a most distinctive fragrance contained within an equally distinctive bottle, a work of precision from a true perfectionist. Definitely a modern classic worth coveting!